Posted by admin on Dec 4th, 2013 and filed under Frontpage. You can follow any responses to this entry through the RSS 2.0. Both comments and pings are currently closed. Apparently dismayed by mixed reactions trailing the coming into power of Owelle Rochas Okorocha as Governor of Imo State, leader of the All Progressive Grand Alliance, APGA, in Imo State, Chief Martin Agbaso have been battling with his conscience since after the 2011 elections as he said that he will soon make a public apology to the people for being instrumental to emergence of the Ogboko born politician as the Governor of the state. Addressing Journalists over the clean bill given to his brother and former Deputy Governor of the state, Sir Jude Agbaso by the Economic and Financial Crimes Commission (EFCC), Chief Agbaso disclosed that EFCC has traced the alleged N458m bribe given to his brother by Joseph Dina to a Bank account in Lebanon. He said, “Today I am exceedingly happy that my brother has been vindicated and the Agbasos name cleared from the mess. But sad that a man can sit in a place to hatch plans how to destroy an innocent man”. Going down memory lane, Chief Agbaso recalled how Imo State House of Assembly hurriedly within two days of the allegation of bribe against his brother concluded their Kangaroo investigation and subsequently impeached him. “I told Imo people and all those who cared to listen that time that no Agbaso son is capable of asking for a bribe for any reason whatsoever”. Chief Agbaso maintained that it was ridiculous that a group of honourable people at the legislature hurriedly went into such a matter of large magnitude and the same day the Justice Njemanze probe panel concluded their own investigation, forwarded it to the House of Assembly who did not hesitate in impeaching an elected candidate the same day. He regretted that rather than face the truth of the matter, the Imo State House of Assembly became a willing tool in the Governor Rochas Okorocha’s evil machinations. Said he, “Governor Okorocha’s inlaw brought the said contractor who Okorocha went ahead to pay the whooping sum of N1.3billion to a journey man for no job done”. Agbaso made it clear, “we are going to take steps to address the perpetrators of this wicked action as well as restore his position as the Deputy Governor through every possible legal process”. On his public apology, Agbaso said that in no distant time, he would address a world press conference on the “man called Rochas Okorocha. I will take my time to apologize to the people of Imo State for aiding Rochas to become Governor”. Agbaso who denied any financial inducement from Okorocha before he surrendered his APGA Guber ticket, said that he would soon open up on what transpired between him and the Governor before the 2011 election. Meanwhile, lawmakers of the Imo State House may have gone into hiding to avoid public attacks over the latest discovery by EFCC. The Imo State House of Assembly were unable to sit for plenary yesterday because the House could not form a quorum. The Speaker of the House, Rt Hon Benjamin Uwajumogu adjourned sitting till today when the House was informed by the Clerk of the House that the House could not form a quorum. Only five of the 27-Member House appeared for sitting. Rt Hon Uwajumogu before adjourning the House welcomed teachers and students of Ray Jacobs Boarding School, Mgbidi, who were on a excursion trip to the House. He apologized on behalf of his colleagues and asked the school to meet with the management of the House to fix a later date. The Speaker noted that the House could not form a quorum because according to him, some of the Lawmakers are having meetings in their various committees while members of Owerri extraction went on a visit to the Governor. 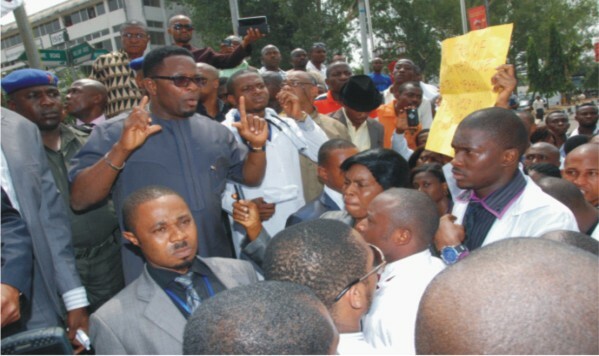 It was learnt that the Lawmakers, apparently aware that they goofed by impeaching Agbaso kept away from the Imo Assembly Complex for fear of attack from mobs demonstrating against the illegal impeachment. In a similar development, a group known as Imo Youth Mandate, a mass based youth organization in Owerri Zone, Imo State, yesterday, staged a peaceful protest over what they described as a depression by Governor Rochas Okorocha to wipe out the face of Owerri Zone from the surface of governance in the state. Briefing Journalists at the Wetheral roundabout, Okigwe road, Owerri, leader of the group, Comrade Soribe Kelechi, noted that Governor Okorocha has done the greatest evil in the state, by impeaching Sir Jude Agbaso, adding that the impeached deputy is innocent of the N450 sham allegation against him. He revealed that Rochas Okorocha connived with his accomplices at Imo House of Assembly to dupe state of her hard earned money and called for the immediate impeachment of the Governor. Comrade Kelechi further stated that since the EFCC has vindicated Sir Jude Agbaso, the IMHA should at once reinstate him as his hands are clean. The youth leader described Okorocha as a man of less prowess, who treats issues that affect the masses with laxity, adding that he has proved his incompetence in governance. Comrade Kelechi also lambasted Speaker Uwajumogu for aiding criminality, noting that he has shown that he is unfit to spearhead the State Assembly. He described Uwajumogu as the worst Speaker Imo State has ever produced, adding that he has made mockery of the state’s legislature. He further blasted Benjamin Uwajumogu for allowing his partner in crime to destroy Imo State, adding that very soon, their lies and fabrications would be adequately treated. “Uwajumogu has proved that he is bereft of knowledge and should vacate from that position he is occupying” he added. Adding his voice, the state youth leader of APGA, Comrade Emeka Nwankwo also lashed Okorocha for disgracing the entire Imo State with his atrocious and evil style of administration, adding that he facilitated the impeachment of Sir Jude Agbaso. He described Governor Okorocha as a man who is ignorant of the machineries of governance and advised him to start packing his evil luggage from Government House. Comrade Nwankwo also lampooned Speaker Uwajumogu for his weakness and irresponsible style of governance, adding that Uwajumogu and his cohorts duped Imo State. He advised Imo Speaker to cover his face in shame, as his leadership has not reflected the wishes and aspirations of Imo people and further mandated Prince Eze Madumere to quickly vanish as Imo Deputy Governor. Comrade Nwankwo however called on civil society organizations and well meaning Nigerians to stop Okorocha and his cohorts from destroying Imo State.